If your dog ate a slug, they could end up seriously ill. You should get them to a vet for a check-up, even if they do not seem to be showing any signs of physical and emotional distress. Is eating slugs harmful to dogs? Slugs and snails can cause lungworm, which can be fatal if left untreated. Also, there is no way of knowing if a slug has eaten toxic pellets. These pellets that are also poisonous to dogs. 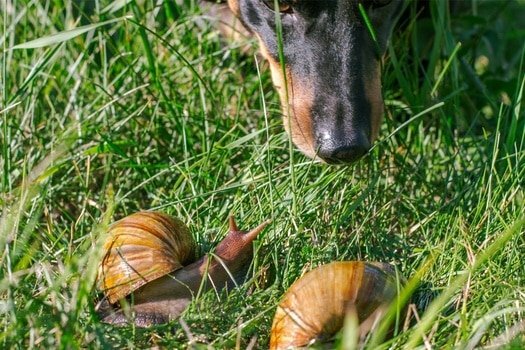 This article will talk you through the experience of your dog eating slugs – what to do if they eat a slug, and perhaps more importantly, how to prevent them from eating slugs and snails as snacks. 1 Why Do Dogs Eat Slugs? 1.1 Can Eating Slugs Make My Dog Sick? 1.3 How Do I Know if My Dog Has Lungworm? 1.4 Can I Vaccinate My Dog Against Lungworm? 1.5 Can My Dog Pass Lungworm onto a Cat? 1.6 Can My Dog Pass Lungworm onto Me, or Another Human? 1.7 What’s the Point of Slugs Anyway? 1.8 Should I Lay Down Slug Pellets to Keep Them Out of My House? Why Do Dogs Eat Slugs? It’s sometimes hard to know what makes slugs so appealing to a dog. Many household pets have a tendency to eat bugs, which is understandable. A small, skittering insect will move at pace, and send your pet’s predatory instincts into overdrive – and once they manage to lay a paw on these critters, their frequently tough exteriors make for a satisfyingly crunchy snack and protein fix. A slug, though? 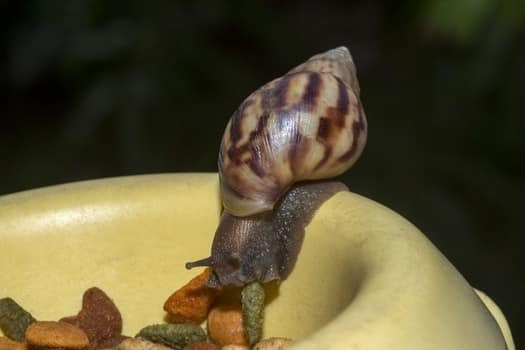 These gastropods move extremely slowly, meaning that your dog will have time to chew on many slugs, take a drink of water and knock the treat jar off the shelf before moseying over and investigating them. Surely the slimy texture of a slug isn’t appealing to a canine palate. The truth is, it isn’t. Slugs taste foul, which is an evolutionary defense mechanism designed to prevent larger animals from making them into meals. The same also applies to the trail that they leave behind them. Alas, this trail will also give off a stench that will interest you. If their curiosity gets the better of them, they may not be able to resist licking the trail, or the creature that made it. In addition to this, there is always the fact that a dog may eat a slug by mistake. Gastropods thrive in moist areas, so they tend to live outdoors – though they will also invade a home when seeking warmth, with kitchens and bathrooms particularly appealing. This means that slugs may be living within leaves, bushes, rivers and other outdoor areas though, as well as living in puddles. If your dog checks everything with their mouth while on a walk, then it’s possible that they may swallow a slug by accident. Can Eating Slugs Make My Dog Sick? Sadly, eating slugs can make your dog very sick indeed. If your dog is munching on a slug that they have encountered outside, there is no way of knowing what else they are eating at the same time. 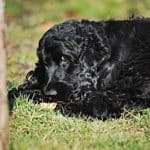 Your dog could be chewing on a leaf that contains all kinds of bird droppings and other animal feces, or a potentially dangerous piece of plant life that the slug was previously attached to. In addition to this, there is the fact that slugs feast on rotten food. If your dog finds himself or herself enraptured by the idea of using a slug as a snack, they may interrupt the creature during its lunch. This could result in pets consuming some rotten meat or fruit at the same time, making themselves ill as their digestive tract cannot cope with the attack. Finally, there is slug repellent to take into consideration. It’s an unavoidable fact that many people lay down slug repellent in their homes and gardens – and maybe even in a public or communal area. If your dog ends up eating slug killer alongside the gastropod in question, or even a dead slug that has been killed by pellets, they will become fatally ill very quickly. Are you getting the picture? Eating a slug is very bad for a dog, so you’ll need to be vigilant. Sadly we haven’t even touched upon the most severe risk to canine health that stems from slugs, either. 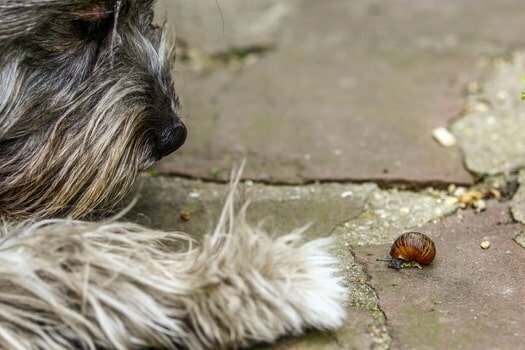 Many slugs and snails carry the lungworm parasite, and if a dog ingests an infected slug, they’ll pass the problem on to the hound in question. Lungworm, also known by the Latin name angiostrongylus vasorum, is an extremely nasty parasite that typically lives within the feces of wild rats and other rodents. Thankfully it’s not quite as prominent in the USA as it is across Europe, but in this era of canine travel, it’s possible that an infestation could reach American shores at any time. Slugs and snails sometimes feed upon these droppings and end up ingesting the larvae found inside the feces. If a dog eats – or even licks – a slug that is carrying the lungworm infection, the parasite will take hold in their body and quickly grow, leading to many health problems. A slug eats the larvae of a lungworm from feces on the ground, becoming carriers of the disease. Your dog licks or eats a slug or snail, or just the trail that they leave behind, and ingests the lungworm larvae. 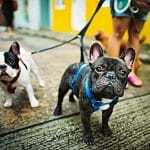 A dog could also develop lungworm through drinking from a puddle, playing with a toy that a slug or snail has crawled all over, or eating the feces of an infected dog. The larvae enter your dog’s gut and start to grow, crawling to the heart. The larvae reach maturity and lay their own eggs, leading to an infestation in your dog’s body. This can cause internal bleeding and hemorrhaging in your dog’s lungs, gut, liver, spine, and eyes. Eventually, your dog will excrete some of the worms and their eggs, leaving more canines and other animals at risk of infection. Lungworm is dangerous and potentially fatal in older dogs and puppies. It’s important that you understand the symptoms of this condition and take an infected dog to a vet for treatment. How Do I Know if My Dog Has Lungworm? If you recognize any of these indications of sickness in your dog, especially after they have potentially eaten a slug, do get a vet to check them out. Also be warned that lungworm can remain dormant for quite some time, so remain vigilant. Can I Vaccinate My Dog Against Lungworm? There are many vaccinations available to protect a dog from lungworm, but there are so many variations of the disease that your pet may not always be 100% covered – vaccination is not an excuse to be slack and to stop paying attention to what your dog is up to. Speak to your vet about the forms of lungworm that are prevalent, and ensure that your dog is as protected as possible. Beyond this, it will be down to you to keep an eye on your animal and make sure they are not making a meal of anything inappropriate. Can My Dog Pass Lungworm onto a Cat? No, cats cannot be impacted by a canine lungworm, and vice versa. They have their own, species-specific breed of parasite. Can My Dog Pass Lungworm onto Me, or Another Human? The lungworm parasite that affects dogs can impact upon a human, but the impact will not be as severe as it is with a dog. It’s also extremely rare and difficult for a human to be impacted with lungworm unless they eat a raw slug or snail that is infected. What’s the Point of Slugs Anyway? You may be wondering why you should tolerate the presence of slugs in your garden, and look into killing every single one of the slimy little so-and-sos off. The truth is, slugs are just as important as snails to the planet’s ecosystem, even if they are not as cute. They provide a food source to other animals that do not live at risk of lungworm, and they often munch on decaying food and vegetation, preventing rotten foodstuff from spoiling and causing injury. Naturally, this doesn’t mean that you need to welcome slugs into your home with open arms – inside the house, they can be dangerous. If you wish to cultivate a natural environment in your garden, however, slugs are a necessary evil. If you are keen to avoid making your garden – and by extension, your house – a welcoming environment for slugs, keep it as dry as possible by night. Slugs are nocturnal, and they will always look for a moist area to spend time in. By watering your lawn and mopping the house in the morning and leaving it to dry out at night, you will be making your home less appealing to a slug that’s looking for somewhere to hang out. Should I Lay Down Slug Pellets to Keep Them Out of My House? If your home is prone to slug invasions that leave your kitchen looking like Jabba the Hutt is hosting a family barbecue, you’ll need to take action. However, resist the urge to throw down slug tablets. Your dog may mistake these poisonous pellets for treats or kibble, and wolf them down like candy. This will be every bit as lethal for your pet as eating a slug, and the sickness will come on considerably faster. Instead of laying down slug pellets, block their access points. Use a flashlight to get a clear look at the trails left behind so trace the slugs back to where they got into the house, and the chances are you’ll find a crack in a wall or under a door, a gaping joint in a set of pipes, or even a vent that feeds something into your house. Close these holes up as much as possible using foam, sealant or electric tape, and if it’s safe to do so, sprinkle a natural slug deterrent inside to prevent them from approaching. You will still need to be cautious about what you use here, especially with salt, as your dog may still be curious about what you’re doing and start lapping up what you lay down. As an extra layer of protection, consider squeezing the juice of a lemon outside the vent or pipe as that will dissuade your dog from investigating any further. If you do lay down slug pellets and you have any reason to suspect that your dog has eaten them, treat this as an emergency and get them to a vet immediately. This is not a situation where you hold fire and keep an eye open, looking for any signs that maybe they’ll be fine – your pet will need critical attention as, depending on the level of toxicity found within the particular pellets, the impact could be fatal in as little as an hour. As Wag Walking explains, the culprit in slug pellets is metaldehyde. This chemical is designed to attract slugs and snails, and once they chow down upon it, it kills them almost on the spot. This is sad, as nobody likes to see an animal die, but arguably necessary. The problem is that metaldehyde is also attractive to mammals, including dogs, and will have the same impact upon a canine body. It’s not just eating slug pellets that can cause problems for a dog. Inhaling them, or getting the pellets in their eyes, can cause all kinds of problems for a canine too. 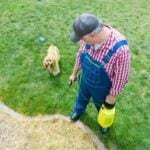 As a result, these particular pesticides are best avoided at all costs if you live with pets, but if your dog does come into contact with them seek help at once. There is no cure for metaldehyde poisoning per se, but a vet may be able to purge your dog’s stomach of the offending items before it’s too late if you get them seen to early enough. Of course, you will also need to be particularly vigilant about identifying the symptoms of metaldehyde poisoning. Aside from the risk of lungworm apparent by eating a slug, your dog may also be tucking into a dead slug that was killed by slug pellets. Sadly, licking a slug – or even the trail that they leave behind – can be just as dangerous to your dog as swallowing the slimy little critter down whole. Be vigilant about watching your pet, and if there is any sign of a slug visitation in your home make sure that you clean it up before your dog can show any interest. If you do notice your dog licking a slug, as before it’s worth getting them checked out by a vet. In the meantime, wash your dog’s mouth out with plain water the best you can. Your pet will not enjoy this experience one iota, and you may well temporarily fall out over it, but it’s for his or her own good. You should also consider brushing your dog’s teeth to clear away any potential remnants of slug slime. Remember though, none of this is a substitute for professional advice or medical attention. Trust your vet to treat your dog when they have had any interaction with a slug or snail – acting quickly may save your pet’s life. Of course, vets can do great things to help dogs that are brought in early, but it’s altogether better for everybody if you can avoid your dog from eating a slug in the first place. Never leave any dog toys outside overnight. When the sun goes down, and the atmosphere gets a little moister, slugs will crawl all over anything on ground level. Don’t place your dog’s bed in a room that slugs invade. If your home is prone to slug invasions overnight, don’t leave your dog unsupervised anywhere slugs may arrive unless they are in a crate. If you do have a visitation, clean up the trail first thing, before your dog leaves their crate or wanders around the house. Prevent your dog from drinking from puddles or eating wild plants. Slugs often live within puddles or leaves, and it’s sometimes impossible to see them until its too late. Don’t take any chances – coach your dog out of this behavior to keep them safe. Master the, “leave it!” command. If you see your dog approaching a slug and looking curious, make it clear in no uncertain terms that they should walk away. A dog eating a slug or a snail is something that needs to be taken seriously, and you should never delay in seeking the advice and help of a vet in such a scenario. We don’t say this to be alarmist, as obviously we will always advocate staying calm in a crisis where your pet is concerned – pets can pick up on stress with ease, and will react accordingly. However, there is nothing to gain by taking any chances and delaying in seeking help. There is every chance that a dog eating a slug will not end badly for your pet at all. Not every slug carries the lungworm disease any more than every dog that your pet encounters with have fleas. However, it’s such a serious concern that it’s always better to prepare for the worst and be pleasantly surprised than vice versa. Vaccinate your dog, keep slugs out of your home, and keep an eye on your pet to ensure they are not chowing down on these slimy visitors. Doing so will ensure that your dog can remain happy and healthy, enjoying everything that the great outdoors has to offer.